(Central Islip, N.Y., Feb. 15, 2017) – The three-time Atlantic League champion Long Island Ducks today announced the signing of left-handed pitchers Eury De La Rosa and Jim Fuller. 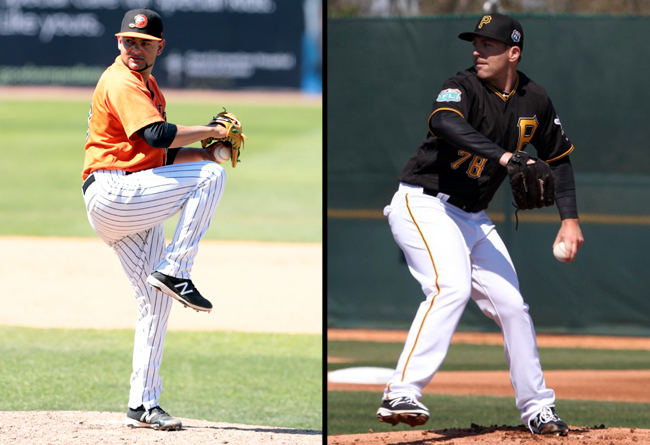 De La Rosa begins his second season with the Ducks and 10th in professional baseball, while Fuller enters his first season with Long Island and ninth in professional baseball. De La Rosa appeared in 39 games (three starts) for the Ducks this past season and posted a 3.26 ERA, one save and 60 strikeouts to just 14 walks over 47 innings of work. He made 11 consecutive scoreless appearances between April 23 and May 21 and had stretches of 15 (April 23 - May 29) and nine (June 3 - 26) straight games without allowing an earned run. Thanks to his performance, the Houston Astros organization purchased his contract on August 14. The 26-year-old went on to make three appearances (two starts) with Triple-A Fresno of the Pacific Coast League. The Dominican Republic native pitched in the Major Leagues with the Arizona Diamondbacks in 2013 and 2014. He compiled a 2-1 record with a 4.21 ERA and 48 strikeouts over 44 games during that time. In his big league debut on July 14, 2013, the southpaw threw two perfect innings of relief against the Milwaukee Brewers. While with the Diamondbacks organization, he was named an MiLB.com Organization All-Star in 2012 and a Northwest League Post-Season All-Star in 2010. De La Rosa was originally signed as an amateur free agent by the Diamondbacks in 2008. Fuller has pitched in four different MLB organizations throughout his career, most recently spending time in 2016 with the Indianapolis Indians (AAA, Pirates). During the 2015 campaign, he went 2-1 with a 2.78 ERA and 34 strikeouts in 27 games with the Nashville Sounds (AAA, Athletics) after being promoted from Double-A Midland. The Massachusetts native totaled a 3-1 record with a 2.41 ERA and 68 strikeouts over 38 games with New Britain (AA, Twins) in 2014. The 29-year-old spent the first five seasons of his career in the New York Mets organization. In that time, he was named a Mid-Season All-Star with the Brooklyn Cyclones in 2009 and both a Mid-Season and Post-Season All-Star in 2010 with the Savannah Sand Gnats. He was also chosen as the South Atlantic League’s Most Outstanding Pitcher in 2010. The Southern Connecticut State University alum has appeared in 156 career games (46 starts), totaling a 29-22 record, a 3.05 ERA, three saves and 425 strikeouts over 410 and one-third innings. Fuller was originally drafted by the Mets in the 21st round of the 2008 amateur draft.